Last weekend I maidened my 1/4 scale Taylorcraft, on floats at my cottage. I am not new to flying off water as I fly my 72in wingspan Cub frequently. The engine I used in the Taylorcraft was a DLE35 and when opened up she lifted off the water no problem. There were some trim issues that unfortunately I couldn't seem to correct effectivly. After the second curcuit as I was banking to come into the downward leg the right wing suddenly rose up, she went inverted an began spiraling in towards the water. I was at least 150ft from the water but try as I may it would not respond to my input. It ended up a crumpled pile of wood floating on the water. I suspect servo failure was to blame. When I was building it I asked the dealer where I bought it if standard servoes would be good enough since I had some extra at home and they said if I boosted the battery voltage from 4.8v to 6v the additional increase in voltage should be plenty for my needs. While building the model there was no mention of the type of servo to be used in the manual. Well, after losing the plane in the way I discribed I sure have my doubts about standard servoes. 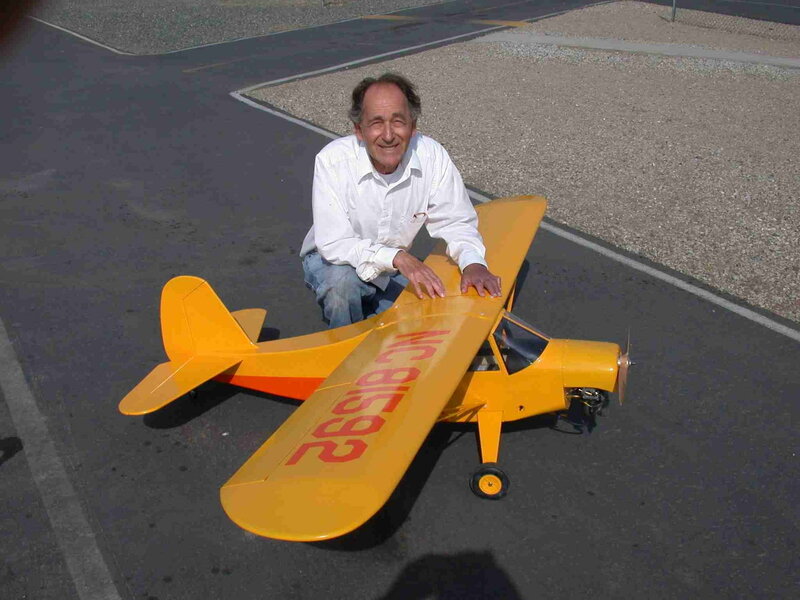 I want to build another 1/4 scale plane to fly off water, but this time a Piper Cub from Balsa USA. The instruction manual didn't say what type of servo to use in the last plane i built and I sure don't want to make the same mistake again. I need to know exactly what type. Plus I would like to use the DLE35 in the new build I am considering, I'm wondering if it would be a good fit since both the Taylorcraft and the Cub have a wingspan of 108 in and weigh roughly the same. Any advise on the engine and servo issues would be greatly appreciated. I used a 40cc engine in this 20 pound Champ and it was overpowered. The servos were Futaba "standard" 50 ounce . The battery pack was 4.8 volts. No problems. why? Because you seem to say you had no control over any control surface. I’d look at the switch or receiver very carefully. You may have lost bind. as far as servo size. Something in the range of HiTech 5645. Standard Servos? What are standard servos? A quick look at the Hitec servos at Servo City shows the Standard category running anywhere from 42 ounces of torque all the way up to 472 ounces. And this is at the servos minimum rated voltage. Some are 4.8 and some are 6 volts. So again, what is a standard servo? In this case, all these servos in the list will fit the SAME servo mounts. Nothing else. I'm gathering the pieces to build a 30% Piper Cherokee 180. 108 inch wing. Should weigh around 25 pounds and pulled by a 50 cc something. What servos? Don't answer. I already know I'll be spending well over $1,000 on servos alone. And they won't be standard servos. Thinking more about this I wonder, how heavy were the ailerons? Reduced speed and power, could the right aileron have drooped had the linkage failed? Causing the roll over? I had a smaller model that had an aileron servo fail right when I put them into full right. The power of the ailerons was such that it seemed like nothing else was responding. But the truth is the other controls were just over powered by the ailerons. Did you cycle the throttle during the decent? That would tell if it was the whole radio or not. Standard servo explained. The term " Standard Servo " used to mean the servo that was included with most radio sets. Usually they were nylon geared servos with about 50 oz. Today the term demonstrates physical size more then anything. So to answer this particular thread topic, for a 30cc sport airplane I would look to standard size servos that are ball bearing, metal geared and have a minimum of 100 oz. To answer why the airplane lost control is beyond the provided information. However I would be curious as to if the suspect servos have stripped gears or not and if you heard and control surface buzz commonly referred to as flutter just prior to the loss of control.